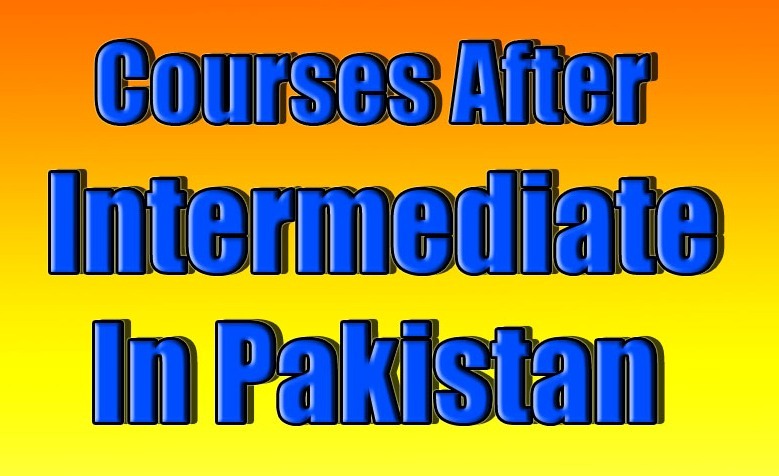 This article is all about the courses that you can take after intermediate in Pakistan. This is very difficult for every student to choose a course or department in which they should be professional. You have heard that a mistaken ambition lead you to the failure. It is so ture that many student ruin their life by choosing wrong decision about their professional education and destroy their future. Student should pick those subjects which he have most interest in not those they thinks that it have a scope. Reason behind this, student works hard to meet the criteria of those subjects that they thinks that have a scope for bright future but if they choose favourite subjects then they have to make less effort to pass with flying marks. Many students also destroy their life by following the parents ambitions. Parents wants their children to become a doctor or engineer but children do not have interest in those subjects so they do not give their part to studies so in result they fail. web study is providing you the whole subjects and departments whose are being studied in all Pakistani institutes and universities. Student can check all those courses and tell their parents that they have interest in those subjects not in those that their parents are asking them to learn. Note that all these subjects are well scoped after completing the education and all these courses are professional degree courses that starts after 12th class grade. This is students duty to know all about the every field and departments so that they should choose their interested one field and they should also suggest their friends to choose subjects that they have in interest. web study is right place where you can get all the details are about Best Degree Courses After 12th Grade In Pakistan. Many people thinks that they should only do MBBS or BDS after F.Sc pre medical. This is all wrong because every student who do FSC medical can not take admission in medical college for MBBS not every medical college or medical university gives admission to every student who apply for MBBS or BDS course. There are also many other course and professional degree programmes that they should do after fsc premedical. You can do DVM, DPT or become a Phycologist or physiotherapist. All the course after fsc premedical are given below. Bachelors of medical and bachelors of surgery (MBBS). Bachelors of dental surgery (BDS). This is a main thought of many people in Pakistan who have done intermediate Pre Engineering that they should only do BS programs of IT, Software Engineering or Computer Science but this is wrong. If you do not get admission in these department then you should try other department because all the BS degree programs have equal scope. You can do Electical Engineering or Mechanical Engineering and So far many fields are in engineering. Here is the list from that you can choose course after intermediate Fsc Pre Engineering. There is large list of Engineering Courses After Intermediate FSC Pre Engineering. This is thinking of almost all the student who have done FA fine arts or humanities that they can only do BA or B.com after FA but they are wrong. Here we will tell you in details that they take admission in many other professional fields that will give benefits them after Bachelors. Note after FA Arts or FA Humanities only choose your favourite subjects to study next. Take those subjects those you thinks that is better for you. Below is the list of courses after intermediate Arts and Fa Humanities. Commerce is very interesting field for them whose favourite subjects are economics or statics etc. Here is whole detail that what you should do after ICOM and DCOM commerce course in Pakistan. You can not choose only B.com, there are many other options available for you that will give you success. You can do Business Administrations (BBA), ACCA, CA or B.Com. These course are common in both male and females and both can choose these. One important thing about these subjects is that these are most rising subjects in whole world. It means that you can do work in abroad also. Although banking and finance is very interesting field. ICS is for those students who have interest in Computer science and latest advancement in Computers. If you have done ICS in 12th then you have to choose same subjects for next level of education. web study is providing you the whole details about all the fields and subjects that you can choose after ics in Pakistan. All the courses after ics in Pakistan are professional have world wide rising fields. Best Fields for student who have done ICS are below.